If you can not capture text / dimension from your drawing in QA-CAD, please click here to see this OCR tutorial. 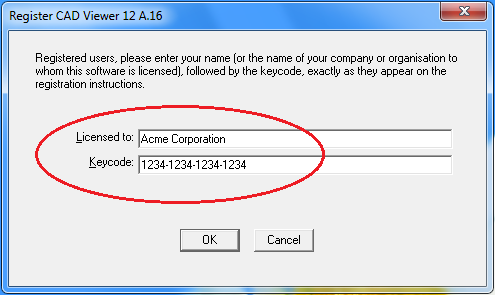 Step 3 - Enter both the License Name and Keycode exactly as supplied. Click 'OK' and your software will be registered. - have you entered both the License Name and Keycode exactly as supplied? - are you trying to enter the Serial Number instead of the Keycode? - is the software the same major version number as the Keycode was issued for? (1) download the correct version. (2) if you have lost your keycode information, send a request to our software support to get your keycode resent to you. (3) if you are eligible for a free upgrade to the latest major software (registered users are eligible for free upgrades for 12 months from the date of purchase) but have not received a new keycode, send a request to to get your new keycode. Download the latest release CAD Viewer here! If your registration is outside of the 12 month free upgrade period you may be required to purchase an upgrade license in order to get the latest software. Upgrade to the latest CAD Viewer here! If you have discovered a software error, it is always recommended to download the latest version of the software prior to reporting the bug, since chances are it has already been fixed. 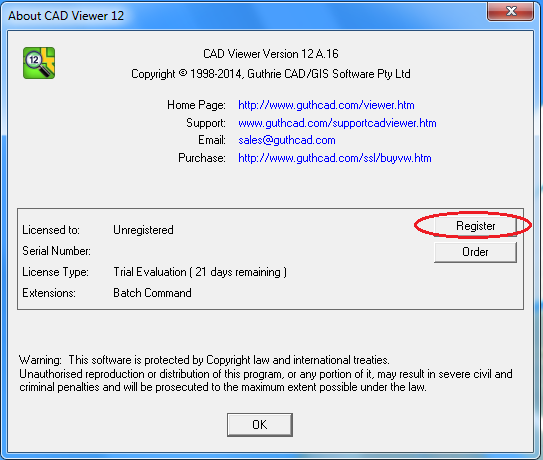 The complete CAD Viewer user manual is included in the download software. 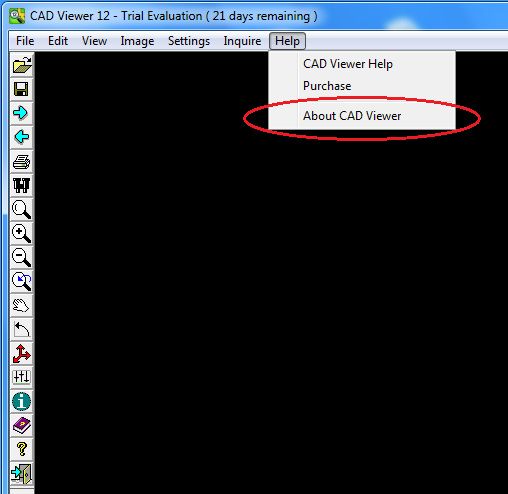 Open the Help file via Start > All Programs > CAD Viewer > CAD Viewer User Guide. (1) Install CAD Viewer on your local drive. (2) Download and run 'HHReg v1.1 - HTML Help registration utility' and add the CAD Viewer help file vwhelp4.chm to the list of .CHM files explicitly allowed to run from a network drive. Archived versions of CAD Viewer are available here. Please send as much detail as possible about the problem being experienced. - write down as much detail as possible about the error, and the steps to repeat it. - if a bug is demonstrated by, or only occurs with a particular drawing then it should be sent if at all possible. Technical support may be obtained by sending an email to our 'Technical Support' email. See here. Q. When I want to launch AutoCAD® 2000, I go directly to the .dwg file and double click the file. Now that I have downloaded and used the Cad Viewer software, when I double click the .dwg file it launches Cad Veiwer instead of AutoCAD. Is this fixable? In the Actions list you should initally see 'CAD Viewer' listed in bold, indicating that it is the default application for opening DWG files. After setting 'open' as the default, 'open' will change to bold. The CAD Viewer installation does not ever touch the 'open' item, so in theory AutoCAD should now be set to the default application for opening DWG files.